The Baroque flute, also called the German flute or traverso, is made of wood and comes in three or four parts, depending upon the model, maker and time period. 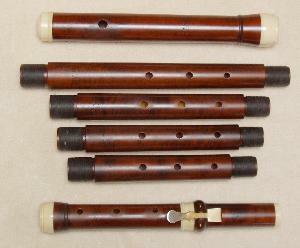 It has one key (or two keys in the case of the special Quantz flute). The very first keyed flute is generally ascribed to the Hotteterre family in Southern France; this family of wind instrument makers was extremely well known. This same family gave rise to the famous Jacques (le Romain) Hotteterre, the composer and pedagogue of the one-key flute, recorder, oboe and musette. Click here to go to the Dayon C. Miller Flute Collection. PUBLIC SITE-READING SESSION BY BAROQUE MUSIC COLLECTIVE AT TWO LOCATIONS IN MILWAUKEE!